For other uses, see Grantland (disambiguation). Grantland was a sports and pop-culture blog owned and operated by ESPN. The blog was started in 2011 by veteran writer and sports journalist Bill Simmons, who remained as editor-in-chief until May 2015. Grantland was named after famed 20th-century sportswriter Grantland Rice (1880–1954). 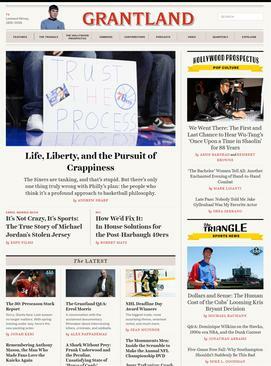 The site featured contributions from Simmons alongside other sports and pop-culture writers and podcasters including: Holly Anderson, Mallory Rubin, Katie Baker, Bill Barnwell, Rembert Browne, Andy Greenwald, Bryan Curtis, Kirk Goldsberry, Steven Hyden, Michael Weinreb, David Jacoby, Jonah Keri, Chuck Klosterman, Molly Lambert, Mark Lisanti, Zach Lowe, Robert Mays, Davy Rothbart, Sean McIndoe, Brian Phillips, Charles P. Pierce, former NBA player Jalen Rose, Shea Serrano, Andrew Sharp, Louisa Thomas and Mark Titus. Former contributors include Men in Blazers duo Roger Bennett and Michael Davies, Tom Bissell, Lane Brown, Jason Concepcion, author Dave Eggers, author Malcolm Gladwell, Justin Halpern, Mark Harris, Jay Caspian Kang, screenwriter of the movie Rounders Brian Koppelman, Juliet Litman, Pulitzer Prize-winning journalist Wesley Morris, Chris Ryan, MacArthur Award-winning novelist Colson Whitehead and Emily Yoshida. On October 30, 2015, ESPN officially announced the shut down of Grantland: “After careful consideration, we have decided to direct our time and energy going forward to projects that we believe will have a broader and more significant impact across our enterprise.”  The closing of Grantland was met with harsh criticism of ESPN, from both former writers of Grantland and admirers of the site. Former Editor-in-Chief Bill Simmons called the shut down “simply appalling.” ESPN president John Skipper said the decision to shut down the site was not a financial matter and instead was done because ESPN did not see the value in spending the time and energy necessary to continue the excellence of Grantland. Simmons started a new media venture in 2016, The Ringer, which, like Grantland, focuses on sports and pop culture. A number of former Grantland employees, including Sean Fennessey, Chris Ryan, Mallory Rubin, Juliet Litman, Craig Gaines, Bryan Curtis, Ryan O'Hanlon, Danny Chau, Shea Serrano, Jason Concepcion, Riley McAtee, Joe Fuentes, and Tate Frazier have joined the new venture. Simmons debuted a weekly show on HBO, titled Any Given Wednesday with Bill Simmons, on June 22, 2016. ^ Crupi, Anthony (June 9, 2011). "Bill Simmons on Launch of Grantland.com and How Sponsors Will Keep the Site Free". Adweek. Retrieved October 31, 2015. ^ a b "ESPN Statement Regarding Grantland". ESPN MediaZone. Retrieved October 31, 2015. ^ Guthrie, Marisa. "ESPN President John Skipper on Bill Simmons: "It Was Business"". The Hollywood Reporter. Retrieved June 21, 2015. ^ Chase, Chris. "Bill Simmons will be replaced at Grantland by Chris Connelly". Ftw.usatoday.com. Retrieved October 31, 2015. ^ Levin, Josh (January 19, 2014). "Digging Too Deep". Slate.com. Retrieved October 31, 2015. ^ Klinger, Lauren; McBride, Kelly. "Lessons learned from Grantland's tragic story on Dr. V". Poynter.org. Retrieved October 31, 2015. ^ Kahrl, Christina (January 20, 2014). "What Grantland Got Wrong". Grantland.com. Retrieved October 31, 2015. ^ Hannan, Caleb (January 15, 2014). "Dr. V's Magical Putter". Grantland.com. Retrieved October 31, 2015. ^ Simmons, Bill (January 20, 2014). "The Dr. V Story: A Letter From the Editor". Grantland.com. Retrieved October 31, 2015. ^ Tannenbaum, Rob (April 29, 2014). "Bill Simmons' Big Score". Rolling Stone. Retrieved October 31, 2015. ^ "ESPN Shutters Grantland, Effective Immediately". Vanity Fair. Retrieved December 1, 2015. ^ "Vanity Fair". Vanity Fair. Archived from the original on February 2, 2015. Retrieved December 1, 2015. ^ "ESPN Closing Grantland Is The Dumbest 'Smart' Business Decision". The Huffington Post. Retrieved December 1, 2015. ^ a b c Reed, Jon. "The fall of ESPN's Grantland – an enterprisey take". Digimonica. Retrieved December 1, 2015. ^ Bonesteel, Matt (2015-10-22). "ESPN layoffs will gut the network's production staff". The Washington Post. ISSN 0190-8286. Retrieved 2016-02-03. ^ "ESPN's Problems Are of Its Own Making -- The Motley Fool". The Motley Fool. Retrieved December 1, 2015. ^ Hobson, Will; Bonesteel, Matt (October 30, 2015). "ESPN shuts down Grantland months after parting ways with Bill Simmons". The Washington Post. ISSN 0190-8286. Retrieved December 1, 2015. ^ a b "Oh ESPN, why did you have to kill Grantland?". chicagotribune.com. Retrieved December 1, 2015. ^ a b Bort, Ryan (2010-04-21). "Bill Simmons Announces New Website, The Ringer". Newsweek.com. Retrieved 2017-02-28. ^ Samer Kalaf (2016-02-17). "Bill Simmons's New Site Has A Name And Some New Hires". Deadspin.com. Retrieved 2017-02-28. ^ Pedersen, Erik (2016-04-04). "Bill Simmons To Produce For 'Game Of Thrones' Aftershow On HBO". Deadline.com. Retrieved 2017-02-28. ^ Michael O'Connell (2016-04-26). "Bill Simmons' HBO Show, 'Any Given Wednesday,' Arrives in June". The Hollywood Reporter. Retrieved 2017-02-28.